Karma Completion helps you rise above the illusory entrapment of ego identification and facilitates realization of your true nature. By seeing through the shadow aspects of personality in the light of non-dual awareness and dissolving the appearance of ignorance, a ground for true transformation arises. Karma Completion is the key. 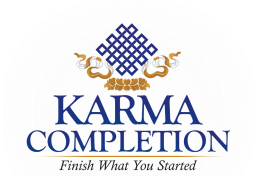 Most people understand karma as the key leftover influences from past deeds in either this life or past lives, which attract the major influences of our lives, such as the people who become our parents, spouses or siblings, or that it may influence the type of work we do in the world. In the East, karma is often used as an excuse not to bother, due to the common belief, “Hey, it’s all predetermined anyway”. It becomes the ego’s excuse to remain in suffering and not to initiate change. It becomes the justification for complacency. In a certain context, the truth is, life is pre-determined, as is your role in it, because from the perspective of Buddha or awareness (that you also are), this is all a dream, and as a mere character in the dream your role is already written. But the good news is, this is actually what makes you free, because you are the Buddha (awakened one) dreaming the play. Thus from the perspective of the character you are in the broad expanse of life, you have no choice, your role is pre-written, but simultaneously you are also the writer: awareness. When you cease identifying as the mere character in the play and realize yourself as Buddha or awareness, real choice returns; no longer are you bound by the pre-written script of the play, recorded in the crystallized thoughts of karma which are stored throughout the energy lines (meridians) of the body. On the highest level of understanding (from the absolute view of awareness) karma does not exist. In the relative world in which we live, however, bound by our identification with ego, (the illusory separate self which is a compilation of thoughts of who we think we are, that is void of substance and yet feels so real), our very belief in ego causes conditioned thoughts to crystallize. ​This results in the phenomena of crystallized memory storage or karma that continually accompanies the mind stream from one life to the next until completed. Thus in the relative world, karma does indeed exist and it controls everything. Because of this, to realize the freedom that we are, the only choice is to free ourselves of ego identification and the illusory control karma has over us. Karma is simply the appearance of ignorance and conditioning and you can move beyond it!